SHOP AT WHOLE FOODS MARKET on Thursday, April 18, to raise funds for HIPHI programs. 2019 IMMUNIZATION CONFERENCE: The 13th national conference will facilitate the sharing of successful strategies to strengthen efforts to improve immunizations. Registration will open in April 2019. HIPHI is a non-profit hub for health, bringing community-based organizations, government, academia, foundations and business together to improve the quality of life for the people of Hawai‘i. Building healthier communities requires collaboration on a variety of issues that impact health, including transportation, education, access to healthy food and economic opportunity. And collaboration is what we do best. 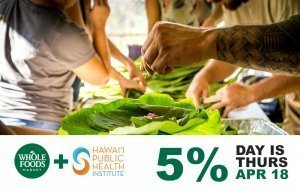 Whole Foods Markets has selected Hawai‘i Public Health Institute (HIPHI) as the beneficiary of their upcoming 5% Day on Thursday, April 18, at all of their Hawai‘i stores. This means that five percent of all net proceeds from all four Hawai‘i locations on Thursday, April 18, will go to support the work of our Healthy Eating + Active Living (HEAL) coalitions and Hawai‘i Farm to School programs. The proceeds will also help fund four Perspectives on Community Health fields trips this October during Farm to School Month. Papa Ola Lokahi has completed the update of the 1986 E Ola Mau (EOM) health needs assessment and is calling it E Ola Mau a Mau. The original EOM report is the basis for the Native Hawaii Health Care Act which was passed by Congress in 1988. Papa Ola Lokahi and the Native Hawaiian Health Care Systems were established as a result and they continue to work to improve the health and well-being of the Native Hawaiian people. 1. Review the findings and outcomes of the 2018 E Ola Mau a Mau report. 2. Summarize progress made since 1985 in improving the Native Hawaiian Health. 3. Discuss the recommendations and strategies to improve Native Hawaiian health and well-being (Mauli Ola). The Hawaii Community Foundation, in partnership with the University of Hawaii, invites you to a compelling and incisive talk. This public talk will also be live-streamed from the Marielena Hinacpie page on the Better Tomorrow Speaker Series web site. Under Hincapié’s leadership, the National Immigration Law Center has emerged as a major force for progressive immigration reform. Combining litigation, advocacy, communications, and alliance-building, the NILC led the legal challenges to Trump’s Muslim ban and to the termination of DACA. Hincapié is now leading a 50-state campaign for local immigrant protection and inclusion. Parking is available on the UH Mānoa campus for $6 after 4 p.m. FLAVORS HOOK KIDS: Did you know that there are more than 15,000 flavors used in tobacco products to hook the next generation on nicotine? The tobacco industry spends more than $25 million each year in Hawai‘i marketing their products to kids while sugary drink manufacturers pay fitness bloggers and researchers to promote diets that include soda. These industries care about one thing and one thing only: profit. That’s where we come in. We, and our coalitions, work every day to stop them in their tracks. We shine a light on their bad acts and we fight for policies that promote health for all Hawai’i residents and visitors. Your gift allows us to do more… and it is tax-deductible!